Join Gloria Copeland and George Pearsons on Believer’s Voice of Victory, as they share the prophetic word for 2019 through Kenneth Copeland: the Year of Abundant Harvest. Learn the definition of a harvest, and how you can stir up a spirit of expectancy to receive your abundant harvest this year. Believe the prophetic word for 2019, release your faith, and watch doors open in your life! Ready to get maximum results in your harvests? 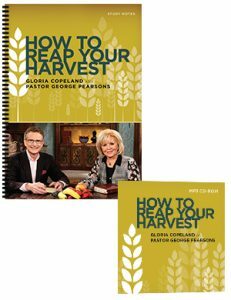 Find out how, as Gloria Copeland and George Pearsons teach you the keys to receiving overflowing harvests on Believer’s Voice of Victory. Learn the steps you can take to ensure this is the year of abundant harvest in every area of your life! Are you facing a famine? Join Gloria Copeland and George Pearsons on Believer’s Voice of Victory, as they share how impossible situations are the perfect setup to receiving supernatural harvests. Learn to follow the same cycle as those who received a hundredfold return in the Bible, and yield your biggest harvests yet! It’s time to say goodbye to living paycheck to paycheck! Watch this episode of Believer’s Voice of Victory, as Gloria Copeland and George Pearsons teach you the importance of receiving extreme harvests all the time. It’s time to believe for an extreme, abundant harvest on every seed you sow! It’s time to move from being seed-minded to harvest-minded! Watch this episode of Believer’s Voice of Victory, as Gloria Copeland and George Pearsons teach you what to do between the “amen” and “there it is.” Don’t wait for your harvest to fall in your lap. Learn how to reap an abundant harvest NOW!